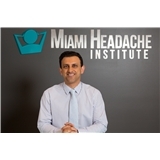 Miami Headache Institute (Coral Gables) - Book Appointment Online! Dr. Sadeghi is very professional and knowledgeable about headaches and was able to address all my concerns and queries. I hope to be able to know the cause of my migraines. I felt comfortable and well treated. He is very profesional. I am so glad to start been his patient.